The Sony Ericsson W995 features the Walkman 4.0 player with all possible extras included and then some. One major addition to version 4.0 is skinning support. The other feature that audiophiles will really appreciate is the 3.5 mm audio jack - a first for the Sony Ericsson Walkman lineup and only second to XPERIA. Accessed from the sleek Media menu or the dedicated Walkman key, the player supports a vast collection of file formats and has several equalizer presets. In addition, you also get Album art and the proprietary Sony Ericsson Shake control making use of the phone's built-in accelerometer. The accelerometer is also put to use for automatic rotation of the display. As we already mentioned, the keys on the side of W995 are a nice set of alternative music controls - they glow so that they're easy to find in the dark and work even with the keypad locked. No worries about accidental presses though: the keys are not raised too much but still easy to press with a finger. The "Now playing" screen is simple but offers all the needed controls and information. The D-pad offers playback controls with their functions shown at the bottom of the screen. Above them is the current track info such as album art, running time, track name, performer and album. Instead of album art you can opt for visualizations, but since they occupy the same small space as the album art, don't expect a great light show. You'd be better off minimizing the player and enjoying the animations on the home screen during playback. These depend on the currently selected Flash Lite theme so they blend in perfectly with it. The homescreen also offers info about the currently playing track, album and artist. Equalizers appear as fullscreen graphics on the Sony Ericsson W995. 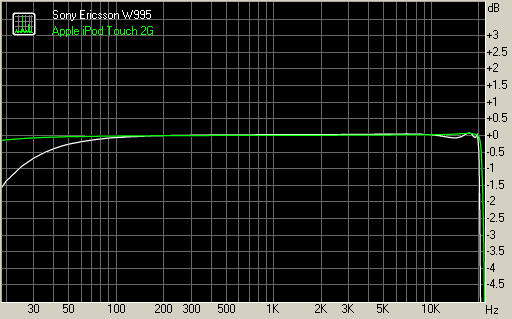 You can also create a custom equalizer if the presets don't do the trick. Another highly promoted Walkman feature is Shake control. It allows you to change the currently running track and even shuffle your entire playlist by a simple flick of the hand. All you need to do to use Shake control is press the Walkman key and shake the phone forward (for going one track forward) or backward (for going a track back). A quick succession of the two moves does the shuffle trick. You can also turn the volume up and down by gently tilting the handset while you hold the Walkman key pressed. The other music-related Walkman goodie, SensMe, is a different approach to populating a playlist. Instead of choosing genre or performer, you are presented with a coordinate system. The vertical axis is the tempo - fast to slow, and the horizontal axis is the mood - sad to happy. Songs are shown as dots placed accordingly and you use a circle to select the one fitting your mood best. You can of course modify the radius of the circle and repeat this several times for any playlist. As cool as that sounds it does have one inconvenience - the songs must be tagged by the Sony Ericsson Media Manager software. To do this you use the manager to transfer the songs with the SensMe analysis option enabled. Tagging songs by hand is not possible so you need to choose between analyzing the songs with the Media Manager, which takes a while, or do without SensMe until you have more time to transfer the songs properly. Sony Ericsson W995 is certainly one of the best efforts from the company in terms of audio quality. It easily ranks among the best examples currently on the market getting an impressive number on every reading in our test. We've been quite worried over the past few devices by Sony Ericsson that went through our sound lab but the W995 clearly shows that they are simply exceptions from the company's otherwise excellent record. The phone flaunts an amazing frequency response keeping within the +-1db range effortlessly with only the lowest of frequencies slightly cut off. Furthermore, for most of its range it is right on the perfect track. Noise level and dynamic range readings are praiseworthy and so are the distortion levels. The crosstalk is also excellent, adding up to one of the industry best quality audio outputs to date. The FM radio on the Sony Ericsson W995 supports RDS and TrackID. You can store up to 20 stations and use the auto save feature to scan and save stations automatically. The radio can be minimized to play in the background and controlled via the Walkman keys but, unlike the music player, it doesn't have any visualization on the home screen, not even the RDS info. The previous/next buttons can be used for tuning in - one short click for going 0.1 MHz up or down, and a longer press for switching between saved stations. Update: Due to the high user interest, we want to make it clear that our test Sony Ericsson W995 didn't have a built-in FM transmitter and despite all the rumors we have no reason to believe that the final retail unit will have that as well. Sony Ericsson have never announced that the W995 will have the feature and further discussions on the matter seem redundant.